Preheat the oven to 425 degrees. 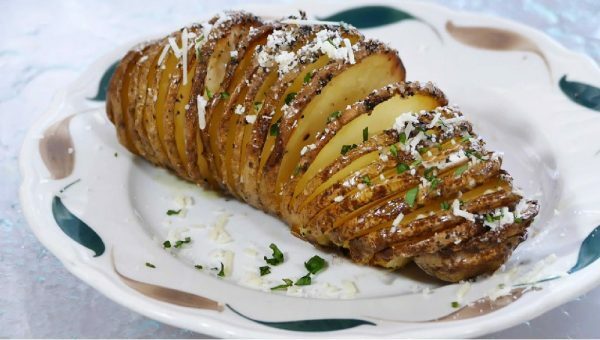 Carefully make thin slices through three quarters of the potatoes, leaving the bottom part unsliced. (Go slowly with this part. It's very easy to cut through the entire potato by accident) Place the potatoes on a baking sheet and brush with either olive oil or melted butter, making sure to coat inside the slices. Bake until tender and crisp on the outside, about 1 hour. Once the potato is cooked, add your toppings. For the cheese and chili potato, heat chili and set aside. Place thin slices of cheese into the slits. Return to oven to melt, about 5 minutes. Then, top with chili and fixings.